Many people and organisations throw educational books away as they think once they are out of date they are unusable. But ‘Book Aid For Africa’ a registered charity takes new, unwanted and second hand text and reference books and distributes them to people in Africa. As long as the books are in good condition and published within the last 15 years they can accept them. Book Aid For Africa is committed to providing African schools, colleges and universities with good quality text and reference books. These books help give children and young people in the remotest parts of Africa a better future. 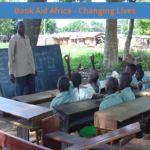 Since Book Aid For Africa was established in 2007 they have shipped over 200,000 books to different countries in Africa that have helped educate thousands of children and young people. They need your help to ensure that every week they help even more. There are many ways you can help this worthwhile charity. Visit www.bookaidforafrica.com for more information about donating books or funds to the charity.